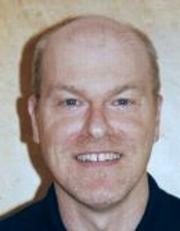 Gerry Bennett was a source of inspiration and a great support to everyone who had the chance to work with him. 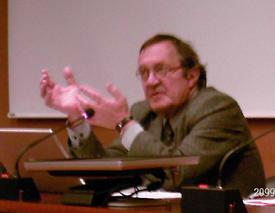 He was a physician, professor, practitioner, researcher, scholar, humanist, and friend. His death is also a huge loss to the medical and scientific community, where he was a renowned geriatrician and researcher. Gerry's was a strong and committed voice, as seen most recently in his work with WHO, for the international effort to prevent family violence and especially elder abuse. His enormous contribution to the field of Elder Abuse was well known not only in the UK but all over the world. 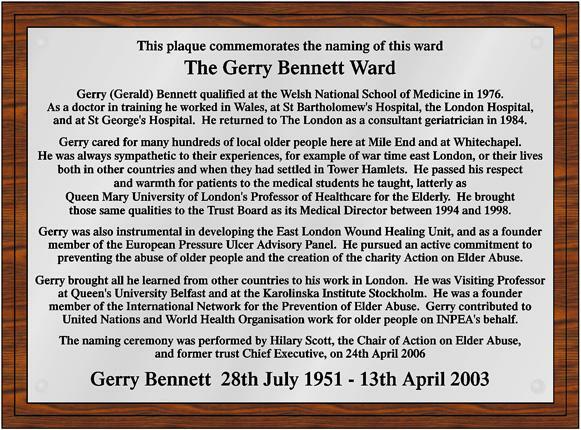 The plaque is installed outside the entrance to the ward where Gerald was consultant at The Royal London Hospital Mile End (London). It is with great sadness that I have to inform you of the the death of Anne Angel, member founder of INPEA, one of our two North American Board Representative Members. Anne passed away on Saturday July 5, in Toronto, Canada, following a short illness over the last few months. Anne was magnificent lady, very supportive to everyone who had the chance to work with her, and did a great deal from her position to help and enhance the INPEA Network from the very start in Adelaide, Australia, 1997. She was a wonderful mother and wife, had a great sense of humour, was a very special cook and was a strong and committed person to everything she thought, believed and worked for. She was a very much loved and appreciated friend, for everybody who had the opportunity to know her well. Her death is a huge and unexpected loss and we are going to miss her a lot. It is with profound sadness that we must inform the members of INPEA's international family of our loss of our dearly beloved, Susana Aguas, INPEA Regional Representative for Latin America and the Caribbean, on October 11, 2008. President Lia Daichman, Susana's lifelong friend and colleague, is creating a memorial tribute to Susana and her work on behalf of older persons in Argentina, Latin America, and the Caribbean, which will become a permanent part of INPEA. We ask friends and colleagues who wish to help us memorialize Susana's many accomplishments, to send them to Lia liadaichman@fibertel.com.ar so they may be posted on INPEA's Website and shared with Susana's family and loved ones. (Photos are also welcome). Charles-Henri Rapin, Swiss representative for INPEA described as a true visionary by Dr. Lia Diachman and beloved by many. A service is planned for July 15, 2008. We regret to announce the death of Pension Munyama, Regional Programme Co-ordinator at ARDC, which occurred on 25th December 2004 in Zimbabwe. Pension had been unwell for a number of months. 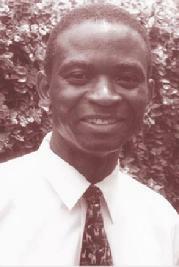 He Joined HelpAge Interntional in May 2001 as the Regional Rights Programme Co-ordinator. 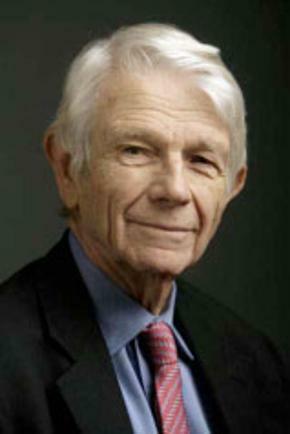 Known as "the father of Geriatrics" who coined the term "ageism"
Dr. Robert Butler, a Pulitzer Prize-winning expert on aging who coined the phrase "ageism," has died in New York City, his daughter said Tuesday. He was 83. He died Sunday of leukemia at Mount Sinai Medical Center, Christine Butler said. Please click here to view links to obituaries of Dr. Butler. Remembering Dr. Robert Butler, Pulitzer Prize-winning longevity expert, and a champion of older people who died recently. He will be remembered as the epitome of aging with dignity, grace and good health, a role model for younger gerontologists and his fans growing by the years. He was a practitioner of all that he prescribed. To read the full memorable tribute from Mala Kapur Shankardass, click here to go to The Hindu web site or click here to download .pdf.